Objective To investigate the incidence of new onset type 2 diabetes mellitus in men receiving steroid 5α-reductase inhibitors (dutasteride or finasteride) for long term treatment of benign prostatic hyperplasia. Design Population based cohort study. Setting UK Clinical Practice Research Datalink (CPRD; 2003-14) and Taiwanese National Health Insurance Research Database (NHIRD; 2002-12). Participants Men in the CPRD who received dutasteride (n=8231), finasteride (n=30 774), or tamsulosin (n=16 270) were evaluated. Propensity score matching (2:1; dutasteride to finasteride or tamsulosin) produced cohorts of 2090, 3445, and 4018, respectively. In the NHIRD, initial numbers were 1251 (dutasteride), 4194 (finasteride), and 86 263 (tamsulosin), reducing to 1251, 2445, and 2502, respectively, after propensity score matching. 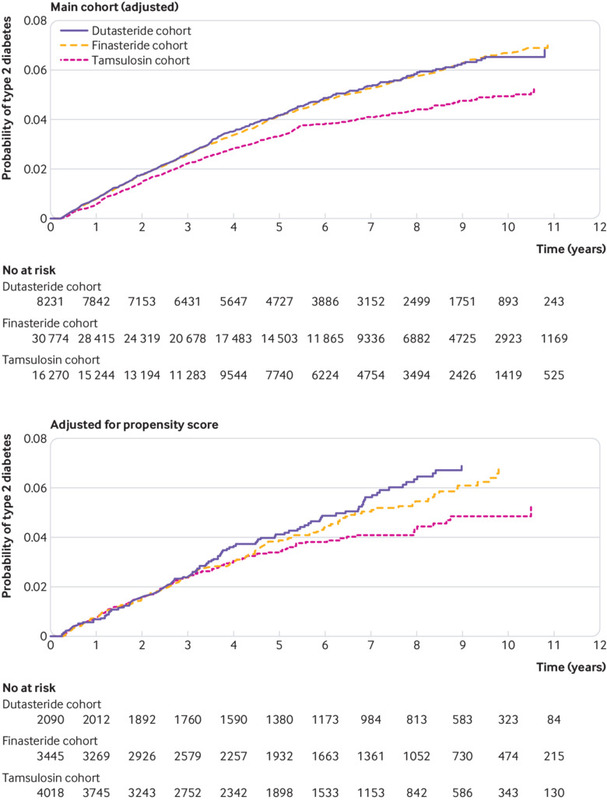 Main outcomes measure Incident type 2 diabetes using a Cox proportional hazard model. Results In the CPRD, 2081 new onset type 2 diabetes events (368 dutasteride, 1207 finasteride, and 506 tamsulosin) were recorded during a mean follow-up time of 5.2 years (SD 3.1 years). The event rate per 10 000 person years was 76.2 (95% confidence interval 68.4 to 84.0) for dutasteride, 76.6 (72.3 to 80.9) for finasteride, and 60.3 (55.1 to 65.5) for tamsulosin. There was a modest increased risk of type 2 diabetes for dutasteride (adjusted hazard ratio 1.32, 95% confidence interval 1.08 to 1.61) and finasteride (1.26, 1.10 to 1.45) compared with tamsulosin. Results for the NHIRD were consistent with the findings for the CPRD (adjusted hazard ratio 1.34, 95% confidence interval 1.17 to 1.54 for dutasteride, and 1.49, 1.38 to 1.61 for finasteride compared with tamsulosin). Propensity score matched analyses showed similar results. Conclusions The risk of developing new onset type 2 diabetes appears to be higher in men with benign prostatic hyperplasia exposed to 5α-reductase inhibitors than in men receiving tamsulosin, but did not differ between men receiving dutasteride and those receiving finasteride. Additional monitoring might be required for men starting these drugs, particularly in those with other risk factors for type 2 diabetes. We investigated whether treatment with dutasteride or finasteride increases the risk of type 2 diabetes compared with tamsulosin alone in two population based cohorts. We also compared the risk of developing type 2 diabetes after dutasteride treatment and finasteride treatment. Our study population included men aged at least 40 with a recorded diagnosis of BPH in their general practice notes, or prescribed dutasteride, finasteride, or tamsulosin. These patients were registered in primary care between 2003 and 2014 (Read codes, supplementary table S1A). Patients were followed up until the end of December 2014 and were censored if they experienced an outcome event, died, left their general practice during the study period, or switched drugs. We excluded patients if they had received prescriptions for finasteride or tamsulosin before 2003 or had a history of cancer, diabetes, or oral glucose lowering or insulin treatment before the index date (date of first prescription of dutasteride, finasteride, or tamsulosin). Our study period was 11 calendar years (2003-14) and we included three cohorts that were identified and followed up in a similar way. The first cohort comprised patients who received at least two prescriptions of dutasteride. These patients entered the study on the date of the first prescription for dutasteride (index date) and were included if they remained in the database for at least 90 days. Patients switching from dutasteride to finasteride or α blockers were censored at that time. We created a separate group of patients concurrently prescribed dutasteride and tamsulosin, but these patients were also included in a “total” cohort along with those prescribed dutasteride alone. A second cohort comprised patients who received at least two prescriptions of finasteride either alone or as a “total” cohort, which included those taking finasteride in combination with tamsulosin. These patients entered the study on the date of the first prescription for finasteride (index date) and were included if they remained in the database for at least 90 days. A third cohort comprised patients who received at least two prescriptions of tamsulosin alone. Tamsulosin was selected as the representative α blocker because it is the most common α blocker prescribed for BPH, which is its sole indication. These patients entered the study on the date of the first prescription for tamsulosin (index date) and were included if they remained in the database for at least 90 days. We excluded patients prescribed tamsulosin without a recorded diagnosis code for BPH (international classification of diseases, ninth revision (ICD-9) code 600). The primary outcome was the incidence of new onset type 2 diabetes during the follow-up period (Read codes, supplementary table S1B), or prescription of oral glucose lowering drugs or insulin. We compared the incidence of new onset type 2 diabetes in the dutasteride and finasteride cohorts versus the tamsulosin cohort, and the incidence in the dutasteride cohort versus the finasteride cohort. Covariates included age, smoking status, alcohol consumption, body mass index and physical activity at index date, and duration of BPH; history of hypertension, dyslipidaemia, and chronic obstructive pulmonary disease; use of β blockers, diuretics, angiotensin converting enzyme inhibitors, angiotensin receptor blockers, statins, and oral corticosteroids in the previous three years; and health status assessed by the number of outpatient visits three months before and three months after the index date. We defined the duration of BPH from the date of the first record of BPH to the index date. For patients who started drug treatment without a previously recorded diagnosis of BPH, the duration was zero. We calculated a propensity score for each patient to minimise confounding by indication, when patients with other risk factors for type 2 diabetes might be more likely to receive dutasteride. We used logistic regression to obtain the propensity score, and the covariables were the confounding variables at baseline (age, smoking status, alcohol consumption, body mass index, physical activity, and duration of BPH from first diagnosis; history of chronic obstructive pulmonary disease, hypertension, and dyslipidaemia; health status assessed by number of outpatient visits three months before and three months after the index date; use of diuretics, angiotensin converting enzyme inhibitors, angiotensin receptor blockers, β blockers, statins, and oral corticosteroids in previous three years). Comparator cohorts matched by propensity score (within ±0.05, comprising up to two matched controls for each dutasteride exposed patient) were created using patients prescribed finasteride or tamsulosin from the same practice. The study was replicated using the Taiwanese National Health Insurance Research Database (NHIRD), which is a validated17 database with more than 99% of the population registered. The NHIRD includes demographic data, information for healthcare professionals and medical facilities, health service records and expenditure claims from inpatient and ambulatory care, and dispensing data. Further datasets include patients with cancer, diabetes, dental problems, catastrophic illness, and psychiatric disease. The study period was from 2002 to 2012. The computer software randomly drew three million patients from the total Taiwanese population of 23 million. We used the same criteria for cohorts, participants, and outcome as described for the CPRD database. Only a urologist prescribed finasteride and dutasteride, therefore records on their use were considered specific for BPH. We excluded patients prescribed tamsulosin without a recorded diagnosis code for BPH (ICD-9 code 600). We defined the outcome of new onset type 2 diabetes by the first record of type 2 diabetes (ICD-9 codes 250.x0 or 250.x2) or use of at least one oral drug for diabetes. We censored patients in the same way as for the CPRD. Covariates included age and duration of BPH from first diagnosis; history of chronic obstructive pulmonary disease, hypertension, or dyslipidaemia; health status assessed by number of outpatient visits three months before and three months after the index date; and previous one year use (standard assessment of previous drug use in Taiwanese database18) of diuretics, statins, angiotensin converting enzyme inhibitors, angiotensin receptor blockers, and oral corticosteroids. We performed propensity matching in the same way as for the CPRD database, but without data on body mass index, smoking status, alcohol consumption, and physical activity. We summarised data as mean (standard deviation) or median (interquartile range) for continuous variables, and number (percentage) for categorical variables. Data distributions and Cox model assumptions were checked before analysis by using proportionality tests and log-log plots. We carried out χ2 tests, one way analysis of variance, and Kruskal-Wallis tests for the baseline characteristics. Person year time for each patient was calculated as the time from the index date to the end of follow-up. We used Cox proportional hazard models before and after propensity matching. In the UK cohort, missing data for body mass index, smoking status, alcohol consumption, and physical activity were categorised into a further group and adjusted in the final model to include all patients. We performed cumulative incidence plots and log rank tests to compare outcomes among the cohorts. Analyses were carried out using SAS software, version 9.4 (Cary, NC). This research was performed without patient involvement. We thank the patients for allowing their records to be retained in the databases. We have included patients in our dissemination strategy. A total of 69 794 patients received at least two prescriptions of dutasteride, finasteride, or tamsulosin (fig 1). After we applied exclusions, 55 275 participants remained; 39 005 patients using 5α-reductase inhibitors were included (8231 dutasteride and 30 774 finasteride) and 16 270 receiving tamsulosin. At baseline, patients receiving dutasteride or finasteride were older, had more comorbidities, except for dyslipidaemia, and used more oral corticosteroids and cardiovascular drugs than those receiving tamsulosin (table 1). There were fewer differences in baseline characteristics between the dutasteride and finasteride groups, with no differences in body mass index. When we included patients receiving dutasteride combined with tamsulosin or finasteride combined with tamsulosin the numbers increased by 599 and 2622, respectively, but baseline characteristics did not change substantively (supplementary table S2). We recorded 2081 new onset type 2 diabetes events (368, 1207, and 506 for the dutasteride, finasteride, and tamsulosin groups, respectively) during a mean follow-up of 5.2 (SD 3.1) years (5.9 (3.1), 5.1 (3.2), and 5.2 (3.1) for dutasteride, finasteride, and tamsulosin, respectively). Cohorts receiving dutasteride combined with tamsulosin or finasteride combined with tamsulosin added a further 27 and 82 events, respectively. Therefore, there were 395 and 1289 events in the “total” cohorts for dutasteride and finasteride, respectively. The event rate was 76.2 per 10 000 person years (95% confidence interval 68.4 to 84.0) for dutasteride and 76.6 (72.3 to 80.9) for finasteride compared with 60.3 (55.1 to 65.5) for tamsulosin. The cumulative incidence of developing type 2 diabetes (P<0.01) was higher in the dutasteride and finasteride cohorts compared with tamsulosin cohort (fig 2). Similar event rates were observed in the “total” cohorts: 76.6 (69.0 to 84.1) for total dutasteride and 76.1 (71.9 to 80.2) for total finasteride. The risk of developing type 2 diabetes was again higher for patients receiving dutasteride or finasteride compared with tamsulosin (table 2). The increase in risk of type 2 diabetes did not differ among patients receiving dutasteride or finasteride alone or when we included patients receiving these drugs in combination with tamsulosin (table 2; fig 2). We included 9553 patients (2090 dutasteride, 3445 finasteride, and 4018 tamsulosin) in the propensity score matching, and most baseline characteristics (specifically body mass index) did not differ (table 1). Duration of BPH was longer for the tamsulosin group than for the dutasteride and finasteride groups. During a mean follow-up time of 5.7 (SD 3.2) years (6.5 (3.1), 5.9 (5.8), and 5.1 (4.7) for dutasteride, finasteride, and tamsulosin, respectively), 105, 127, and 144 new onset type 2 diabetes events were recorded. The event rate per 10 000 person years was 77.2 (95% confidence interval 62.5 to 91.9) for dutasteride, 71.3 (59.7 to 82.9) for finasteride, and 62.0 (51.2 to 72.7) for tamsulosin. 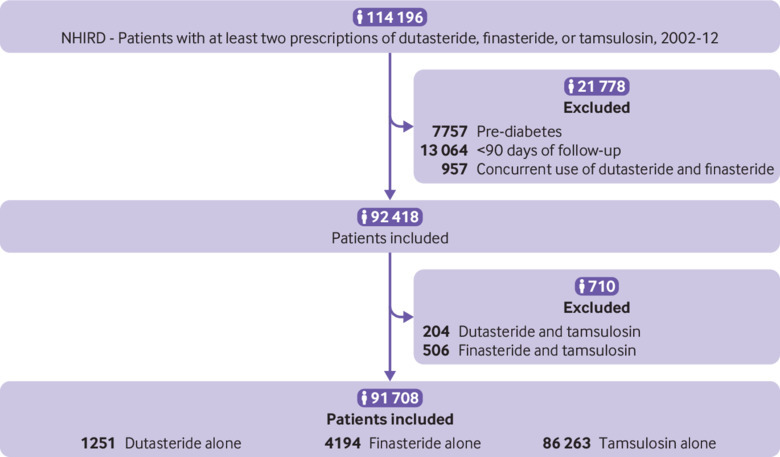 The risk of type 2 diabetes was greater in patients receiving dutasteride than in those receiving tamsulosin (increased cumulative incidence; fig 2), with a point estimate hazard ratio of 1.34 (95% confidence interval 1.02 to 1.75). After propensity score matching, the rate of type 2 diabetes in the finasteride cohort no longer differed from the rate for tamsulosin (1.22; 0.95 to 1.57; table 2). However, there was an increased risk of type 2 diabetes for finasteride in the total cohorts. 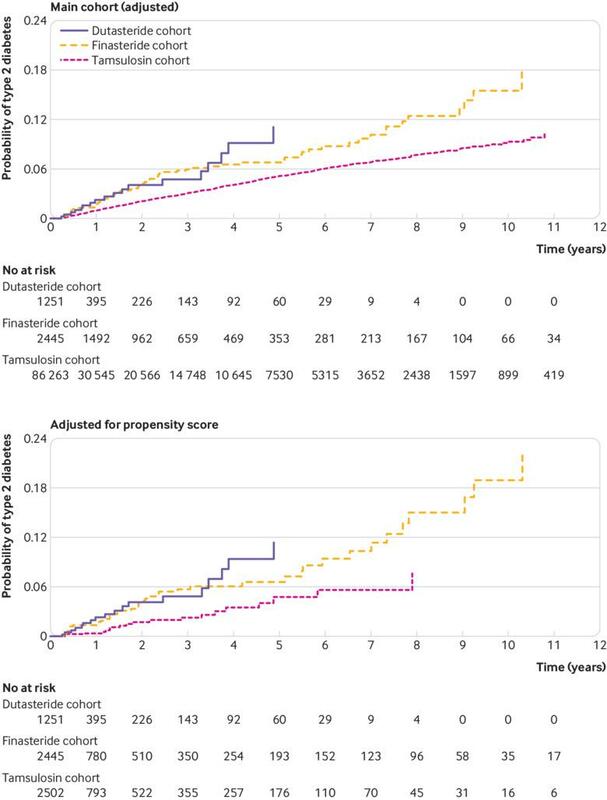 Again, the risk did not differ between dutasteride and finasteride when prescribed alone (1.08; 0.83 to 1.40) or when we included patients receiving these drugs in combination with tamsulosin (1.04; 0.82 to 1.31). Figure 3 shows the cohort selection for the NHIRD, and table 3 (prescribed single drugs) and supplementary table S3 (total cohorts receiving single drugs or combination treatment with tamsulosin) present the baseline characteristics. Taiwanese patients were younger than UK patients and took fewer drugs for cardiovascular indications, but more oral corticosteroids. Similarly to the UK patients, Taiwanese patients receiving tamsulosin were slightly younger than those receiving dutasteride or finasteride. More patients had dyslipidaemia in the dutasteride group. We recorded 1028 new onset type 2 diabetes events (21, 68, and 939 for the dutasteride, finasteride, and tamsulosin, respectively) during a mean follow-up time of 3.1 (SD 4.5) years (2.2 (3.2), 3.4 (4.7), and 2.9 (4.5) for dutasteride, finasteride, and tamsulosin). The event rate per 10 000 person years was 152.8 (95% confidence interval 144.5 to 161.5) for dutasteride and 109.1 (105.9 to 112.5) for finasteride compared with 74.7 (74.2 to 75.2) for tamsulosin. The event rates for the total cohorts were similar (155.2, 142.1 to 169.1 for dutasteride combined with tamsulosin; 111.3, 97.1 to 127.7 for finasteride combined with tamsulosin). The risk of developing type 2 diabetes (table 2) was higher for patients receiving dutasteride or finasteride compared with tamsulosin (adjusted hazard ratio 1.34, 95% confidence interval 1.17 to 1.54; and 1.49, 1.38 to 1.61, respectively), but the risk for dutasteride and finasteride did not differ (0.90, 0.77 to 1.06). Figure 4 shows the increased cumulative incidence of type 2 diabetes. Results were similar in the total cohorts when we included patients receiving combination treatment (table 2). We included 6198 patients (1251 dutasteride, 2445 finasteride, and 2502 tamsulosin) in the propensity score matching. Baseline characteristics were similar among cohorts (table 3). The mean follow-up times were 2.9 (SD 3.4) years (2.2 (3.2), 3.2 (3.5), and 2.9 (3.3) for dutasteride, finasteride, and tamsulosin, respectively). The associated event rates per 10 000 person years for type 2 diabetes were 152.8 (95% confidence interval 144.5 to 161.5), 111.4 (107.1 to 115.8), and 79.7 (76.6 to 82.9), with 21, 35, and 25 new onset events recorded. The risk of type 2 diabetes in patients receiving dutasteride and finasteride was higher than in those receiving tamsulosin: hazard ratio 1.18 (95% confidence interval 1.00 to 1.40) and 1.61 (1.46 to 1.80), respectively; however, the risk did not differ between dutasteride and finasteride (0.94, 0.80 to 1.11; table 2). Figure 4 shows the increased cumulative incidence of type 2 diabetes. These findings were corroborated by the results for the total cohorts, which also included patients receiving combination treatments (table 2). Previous short term studies suggest that dutasteride but not finasteride might increase the risk of type 2 diabetes by impairing insulin sensitivity and increasing steatosis.89131419 Our pharmacoepidemiological analyses show that the incidence of type 2 diabetes was increased in patients with BPH receiving dutasteride compared with tamsulosin, but an increased risk was also seen in patients receiving finasteride. In the UK, for every 10 000 person years of treatment, type 2 diabetes occurs in 76 patients treated with dutasteride or finasteride, but only in 60 patients treated with tamsulosin. These data are comparable to the increased incidence of type 2 diabetes with statin use.2 The risk we identified is modest, but consistent between the two study populations. We performed a sensitivity analysis by propensity score matching for differences in baseline variables, including body mass index and statin use, and the increased risk of developing type 2 diabetes remained. Our findings were replicated in the Taiwanese cohort: we recorded 78 and 35 extra events for every 10 000 person years of treatment for dutasteride and finasteride, respectively, compared with tamsulosin, against an overall higher incidence of type 2 diabetes in the Taiwanese population. We observed this increased risk whether dutasteride or finasteride was prescribed alone or combined with tamsulosin. A major strength of this study was the cohort design. We used two large healthcare databases with different ethnic populations and made adjustments for known confounders. Our findings reflect usual healthcare practice in the UK and can be generalised to other populations. Nonetheless, differences in practice were apparent between the two countries. The healthcare system in Taiwan does not have primary and secondary care divisions and has less emphasis on health screening and preventive treatments, such as statins. Overall type 2 diabetes incident rates were higher in Taiwan than in the UK, with younger patients affected. This finding is consistent with Asian populations having higher incident rates of type 2 diabetes than European populations.202122 The Taiwanese database does not contain data for body mass index, smoking status, and alcohol consumption, and we could not control for these potential biases. Body mass index is a potential confounding risk factor for type 2 diabetes, but the comparable risk for both 5α-reductase inhibitors persisted in the CPRD cohort after adjustment and after effective matching by propensity score. Moreover, we conducted a further survival analysis with a time dependent variable of body mass index, and the results remain similar (supplementary table S4). In the NHIRD there is also a lack of detailed information on socioeconomic factors, lifestyle behaviours, imaging, and biochemical data. The follow-up period was shorter in Taiwan and could reflect differences in prescribing practices or the healthcare setting. We used the well established method of grouping all missing data into one category in the final model, rather than multiple imputation; multiple imputation makes the assumption that data are missing at random, which is often not the case with medical data. The power in the CPRD study was constrained by the number of patients receiving dutasteride. Finasteride has been “off patent” for longer, whereas generic dutasteride has only been available since 2014. However, given the substantial overlap in the risks between finasteride and dutasteride, and replication of the findings in Taiwan, a difference in risk would probably not be uncovered with larger numbers. The characteristics of the most appropriate control population in the setting of type 2 diabetes in BPH are debatable, and untreated patients are not available for study across a suitable timescale. There are inherent differences in disease severity in patients receiving tamsulosin compared with those receiving 5α-reductase inhibitors; 5α-reductase inhibitors are prescribed in patients with enlarged prostates and tamsulosin is favoured as first line treatment for lower urinary tract symptoms. These differences in indications could differentiate between two patient populations that have varying susceptibilities to metabolic disease. The most probable confounders are metabolic risk factors, and we sought to address these factors as far as possible through propensity score matching. Scoring with body mass index in the CPRD data allowed matching of obesity at the index date, and this did not change the outcome. However, longer duration of obesity before the study period might have resulted in an enlarged prostate and thus a greater likelihood of prescription of 5α-reductase inhibitors. We further analysed data with a time dependent variable of body mass index, and the results showed little difference. The propensity score matched analysis included only a quarter of the patient cohort because of predictable difficulties matching baseline variables in these cohorts with high precision. Although the possibilities of an unknown mechanism and reverse causality remain, the patient groups on 5α-reductase inhibitors are at an increased risk of type 2 diabetes. An alternative hypothesis could be that tamsulosin might protect patients from developing type 2 diabetes as opposed to 5α-reductase inhibitors accelerating the process. However, because the diagnosis of BPH was made on presentation of symptoms and owing to the effectiveness of treatment, it was not possible to study patients without intervention over this timescale. Reassuringly, the rates of type 2 diabetes in patients receiving tamsulosin (approximately 60 per 10 000 person years) were comparable to those in the general population (42-64 per 10 000 patients26). Importantly, inclusion of patients receiving tamsulosin combined with a 5α-reductase inhibitor revealed the same increased risks of type 2 diabetes as patients receiving a 5α-reductase inhibitor alone. However, numbers of patients using combination treatments were low, preventing a meaningful analysis of these groups. In an additional analysis, we compared the rates of new incident type 2 diabetes with patients receiving surgical treatment: transurethral resection of the prostate. We found some evidence in the NHIRD cohort that patients receiving tamsulosin were less likely to develop type 2 diabetes than patients undergoing surgery, but this was not evident in the CPRD cohort (supplementary tables S5 and S6). However, these patient groups were poorly matched, even after propensity scoring. We conclude that there is a possibility tamsulosin offers some protection against type 2 diabetes, but there is an adverse effect of 5α-reductase inhibitors. A randomised controlled trial is needed to study this hypothesis further. Based on previous experimental medicine studies, we anticipated an increased risk of type 2 diabetes only in the dutasteride cohort; the greater risk of type 2 diabetes in patients receiving finasteride contrasts with its lack of measurable effect on metabolism after three months of treatment.8 However, although the point measures of the hazard ratios suggest an increased risk of approximately 30% in the UK population for dutasteride and finasteride, the relation was weaker with finasteride. In rodents, disruption of 5αR1 but not 5αR2 causes insulin resistance, fatty liver, and susceptibility to liver fibrosis.1314 However, in rodent liver only 5αR1 is expressed, whereas in human liver both isozymes of 5α-reductases are present.8 Urinary steroid profiling in humans showed robust reductions in 5α reduced steroid metabolites with finasteride and dutasteride,8 although dutasteride lowers circulating dihydrotestosterone to a greater extent than finasteride (approximately 90% v 70%).31 Thus, it is plausible that both drugs affect liver metabolism. However, changes in insulin sensitivity with dutasteride can be detected sooner using sensitive euglycemic hyperinsulinemic clamps because of its greater potency, while the more modest biochemical effect of finasteride has an accumulated risk over time. Tamsulosin is recommended as first line treatment for patients with symptomatic BPH.10 5α-reductase inhibitors are recommended especially in patients with larger prostates, but currently no guidance is available about choosing dutasteride or finasteride. In this study, the risk of type 2 diabetes was similar for dutasteride and finasteride. Patients receiving these drugs are older and more susceptible to metabolic disease. Therefore, it will be important to consider the risk of development or exacerbation of type 2 diabetes when prescribing these drugs and to apply suitable monitoring strategies. This study should alert clinicians that patients starting 5α-reductase inhibitor treatment might benefit from early lifestyle advice and monitoring of type 2 diabetes. Why are patients receiving 5α-reductase inhibitors at increased risk of type 2 diabetes? 5α-reductases are highly expressed in the liver, but also in other tissues critical for insulin sensitivity—for example adipose tissue and skeletal muscle. The enzymes metabolise a range of steroids, including testosterone, cortisol, progesterone, and aldosterone. The increased susceptibility to type 2 diabetes might reflect changes in these hormones, most plausibly androgens or glucocorticoids. 5α-dihydrotestosterone is a more active androgen than testosterone, so inhibiting its formation with dutasteride or finasteride32 could induce features of androgen deficiency, which include insulin resistance. Low circulating levels of testosterone are associated with an increased risk of type 2 diabetes33 in men, a relation also obvious after androgen deprivation therapy in prostate cancer.34 Interestingly the patients we studied will have low 5α-dihydrotestosterone but their levels of testosterone are possibly higher; therefore, they would only be androgen deficient at a localised tissue level where 5α-reductases are expressed, including liver and adipose.8 Importantly castration in rodent models did not protect against the adverse metabolic effects of 5α-reductase inhibitors,13 which suggests other factors are at play. Prevention of inactivation of cortisol by 5α-reductases could lead to accumulation of glucocorticoid in metabolic tissues, again promoting insulin resistance. The increased risk of type 2 diabetes has been studied up to 11 years and might continue to rise; therefore, patients would require longer follow-up, particularly considering treatment could be lifelong. Further investigation is now required to uncover whether these patients are also more at risk of diabetic complications. Finally, further studies could explore the unmeasured confounders by conducting an instrumental variable analysis, with the instrumental variable carefully chosen and validated. Men using steroid 5α-reductase inhibitors for BPH appear to be at a modest increased risk of developing type 2 diabetes. Caveats exist about biases and confounders within population cohort studies. However, in the light of our findings, the decision to prescribe 5α-reductase inhibitors for men with metabolic disease must be considered carefully in the context of other risk factors for type 2 diabetes. In addition, monitoring of fasting glucose might be advisable. We thank Laurence Stewart (urologist NHS Lothian) and Sarah Wild (professor of epidemiology and honorary consultant in public health) for their helpful peer review of the manuscript. BRW and RA are supported by the Wellcome Trust and British Heart Foundation. Funding: This study was funded by Edinburgh and Lothians Health Foundation. The funder had no role in the design, conduct, or data interpretation of the study. The researchers were independent from the funders, and all authors, external and internal, had full access to all of the data (including statistical reports and tables). Competing interests: All authors have completed the ICMJE uniform disclosure form at www.icmje.org/coi_disclosure.pdf and declare: no support from any organisation for the submitted work; no financial relationships with any organisations that might have an interest in the submitted work in the previous three years; no other relationships or activities that could appear to have influenced the submitted work. Ethical approval: The study protocol was approved by the independent scientific advisory committee for UK Medicines and Healthcare Products Regulatory Agency database research (protocol No 13_189) and the institutional review board, National Cheng Kung University Hospital (protocol No -/B-EX-105-023). Data sharing: No additional data are available. Transparency: The lead author (the manuscript’s guarantor) affirms that the manuscript is an honest, accurate, and transparent account of the study bring reported; that no important aspects of the study have been omitted; and that any discrepancies from the study as planned (and, if relevant, registered) have been explained. This is an Open Access article distributed in accordance with the terms of the Creative Commons Attribution (CC BY 4.0) license, which permits others to distribute, remix, adapt and build upon this work, for commercial use, provided the original work is properly cited. See: http://creativecommons.org/licenses/by/4.0/. Services UDoHaH. Guideline on the management of benign prostatic hyperplasia (BPH). 2010 NGC-8255.
. Global Reports on Diabetes.WHO, 2016. Bank TW. Diabetes prevalence (% of population ages 20 to 79). 2018; https://data.worldbank.org/indicator/SH.STA.DIAB.ZS. Accessed 18/11/2018, 2018.